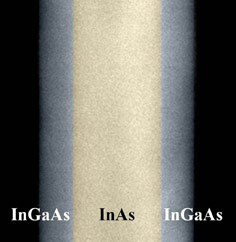 Researchers at the University of Illinois at Urbana-Champaign have grown nanowires of the material indium gallium arsenide (InGaAs) on a sheet of graphene, discovering that InGaAs wires grown on graphene spontaneously segregate into an indium arsenide (InAs) core with an InGaAs shell around the outside of the wire. Champaign, Illinois — When a team of University of Illinois engineers set out to grow nanowires of a compound semiconductor on top of a sheet of graphene, they did not expect to discover a new paradigm of epitaxy. The self-assembled wires have a core of one composition and an outer layer of another, a desired trait for many advanced electronics applications. Led by professor Xiuling Li, in collaboration with professors Eric Pop and Joseph Lyding, all professors of electrical and computer engineering, the team published its findings in the journal Nano Letters. Nanowires, tiny strings of semiconductor material, have great potential for applications in transistors, solar cells, lasers, sensors and more. Li’s group uses a method called van der Waals epitaxy to grow nanowires from the bottom up on a flat substrate of semiconductor materials, such as silicon. The nanowires are made of a class of materials called III-V (three-five), compound semiconductors that hold particular promise for applications involving light, such as solar cells or lasers. The group previously reported growing III-V nanowires on silicon. While silicon is the most widely used material in devices, it has a number of shortcomings. Now, the group has grown nanowires of the material indium gallium arsenide (InGaAs) on a sheet of graphene, a 1-atom-thick sheet of carbon with exceptional physical and conductive properties. Thanks to its thinness, graphene is flexible, while silicon is rigid and brittle. It also conducts like a metal, allowing for direct electrical contact to the nanowires. Furthermore, it is inexpensive, flaked off from a block of graphite or grown from carbon gases. The researchers pump gases containing gallium, indium and arsenic into a chamber with a graphene sheet. The nanowires self-assemble, growing by themselves into a dense carpet of vertical wires across the surface of the graphene. 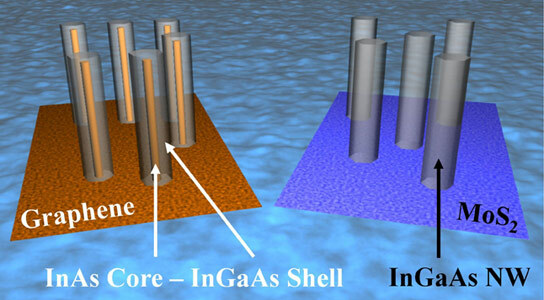 Other groups have grown nanowires on graphene with compound semiconductors that only have two elements, but by using three elements, the Illinois group made a unique finding: The InGaAs wires grown on graphene spontaneously segregate into an indium arsenide (InAs) core with an InGaAs shell around the outside of the wire. So what causes this spontaneous core-shell structure? By coincidence, the distance between atoms in a crystal of InAs is nearly the same as the distance between whole numbers of carbon atoms in a sheet of graphene. So, when the gases are piped into the chamber and the material begins to crystallize, InAs settles into place on the graphene, a near-perfect fit, while the gallium compound settles on the outside of the wires. This was unexpected, because normally, with van der Waals epitaxy, the respective crystal structures of the material and the substrate are not supposed to matter. “We didn’t expect it, but once we saw it, it made sense,” Mohseni said. In addition, by tuning the ratio of gallium to indium in the semiconductor cocktail, the researchers can tune the optical and conductive properties of the nanowires. Next, Li’s group plans to make solar cells and other optoelectronic devices with their graphene-grown nanowires. Thanks to both the wires’ ternary composition and graphene’s flexibility and conductivity, Li hopes to integrate the wires in a broad spectrum of applications. “We basically discovered a new phenomenon that confirms that registry does count in van der Waals epitaxy,” Li said. This work was supported in part by the Department of Energy and the National Science Foundation. Postdoctoral researcher Ashkan Behnam and graduate students Joshua Wood and Christopher English also were co-authors of the paper. Li also is affiliated with the Beckman Institute for Advanced Science and Technology, the Micro and Nanotechnology Lab, and the Frederick Seitz Materials Research Lab, all at the U. of I. Be the first to comment on "InGaAs Nanowires Grown on Graphene Have Unique Structure"